Sam Allen Interiors is my newest obsession. Sam Allen's style is oh so tres chic- he brings in elements of Parisian charm and Hollywood glamour to create bold, beautiful spaces. At only 19 years old, he has already created a successful business in the greater Manhattan area in Connecticut. In utter honesty, I have never been so in love with a designer's portfolio. 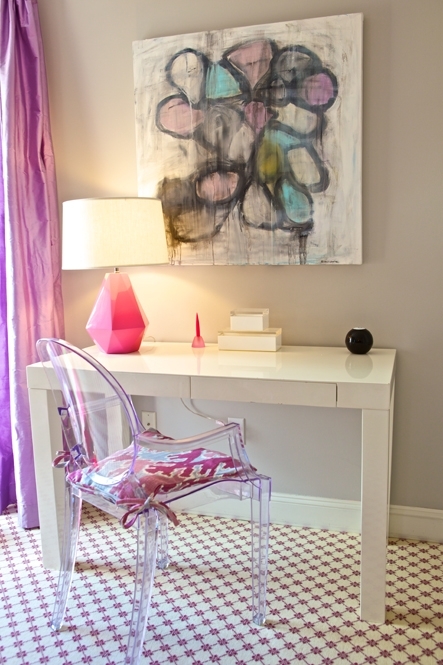 I love the feminine pinks and purples infused in this house. 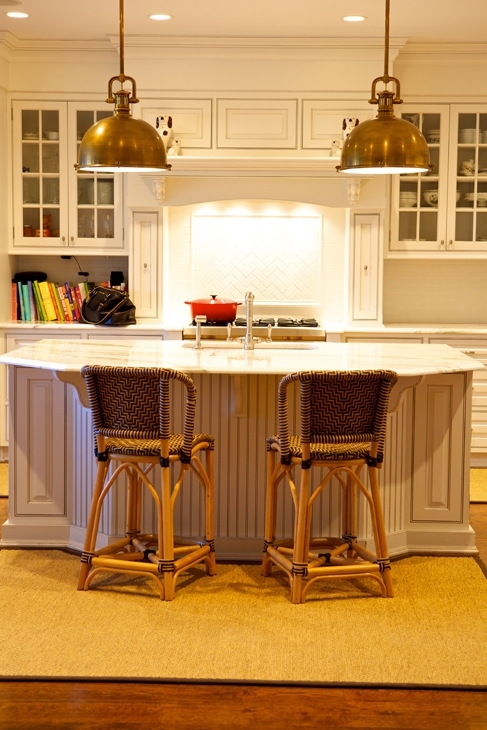 The gold light pendants in the kitchen add such visual appeal as do the Parisian bistro bar chairs. This trellis patterned entry cushion adds pretty detail to this entryway. And, as a lover of all things tufted, I love the chaise lounge the most. The leopard settee juxtaposed against the gray-blue curtains creates such visual appeal, especially when placed in a room with such beautiful gold accents. 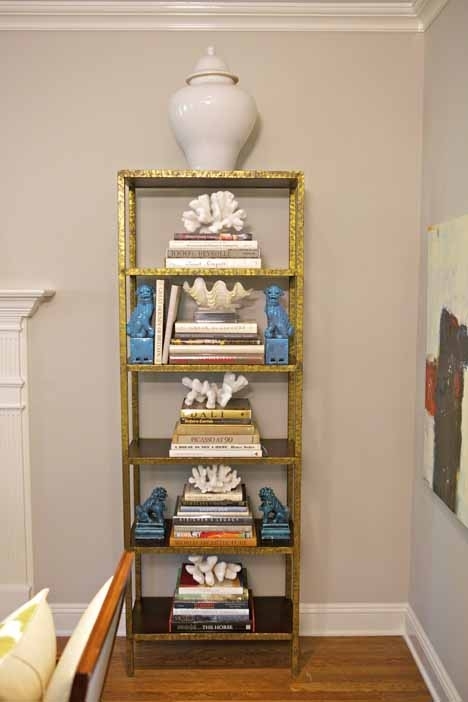 The bookshelf, moroccan puffs, and the nailhead trims on the chair add just the right amount of gold to create a luxe vibe. It is quite clear that every detail in these rooms have been carefully curated to create a classic glam vibe. Wow, I need to get my pin boards warmed up for a pin-a-thon :D Gorgeous! 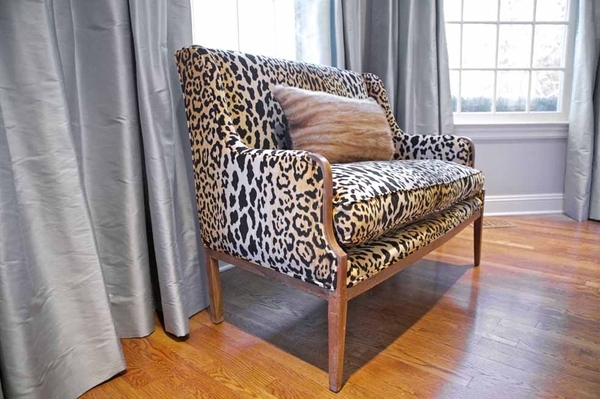 I am in LOVE with that leopard settee! Oh my gosh, so much gorgeous!! That entryway is absolute perfection. I adore it. I discovered Sam Allen some time ago and was astounded by his story and his age. A true talent. Amazing! Thanks for bringing this to my attention. All the pictures/spaces are stunning! How could I not love a guy that loved buddahs and foo dogs? I love his style! Happy Friday! Pardon me while I wipe the drool. OMG. 19!? What am I doing with my life!? His design aesthetic is perfection. So much gorgeous girly goodness! It's all really beautiful. Thank you for introducing us to this amazing designer, I'm still in shock he is accomplishing all of this at the ripe age of 19! 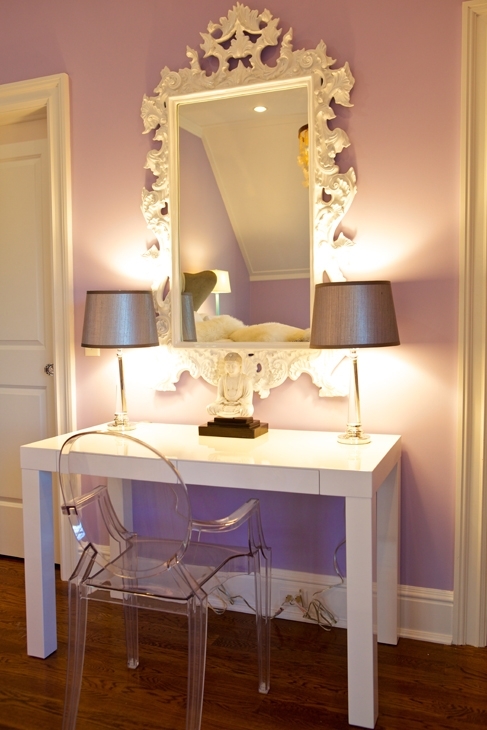 Love the small details, like the lucite chair cushion. Hope you have an incredible weekend Sam! WOW - all these are absolutely gorgeous! Thanks for sharing all of these pictures! Such great ideas and love his style! 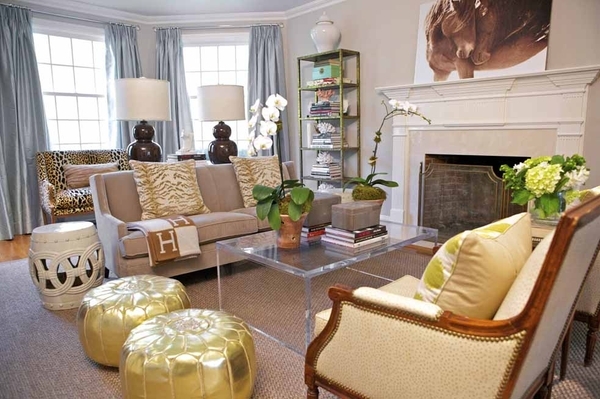 I've never been a girly girly girl but those top rooms look so amazing, love them! Agreed! I feel like I was just transported to a French girl's room! oh my this is so perfect. saving. Seriously, this is amazing...like unbelievable! Just think where he'll be in 5 years! I can wait to dive into his portfolio! oh my gosh! I love these interiors! absolutely gorgeous! Lavender is one of my favourite colours, so I absolutely adore these interiors - thanks for sharing! holy mol she is amazing- these are absolutely GORGEOUS!!!!! Only 19 - that's amazing! I love the colour combinations especially the first photo! Whoooooah! I'm obsessed with all of the color and prints he uses! 19? Get out!!! Did I read that right, 19?!?!? I'm embarrassed to show what I considered stylish when I was 19. Impressive work, man. Love the purple color paint on the wall....what is the color name of the paint? thank you!